Life is short. Eat dessert first. Or, in this case, blog about it first. I took off work on Friday to bake and cook and clean for our first annual Oktoberfest party. And I enjoyed every minute. Does that make me odd? I hope not. I put on my apron, laid out my cookbooks and recipe cards, and turned up an old favorite playlist (featuring Tristan Prettyman and Chris Pureka). I don’t do much baking — mostly because Nick and I are incapable of rationing a pan of brownies or chocolate cake — but I do enjoy it. Let me share with you two tips I’ve learned that almost always make for better baked goods. 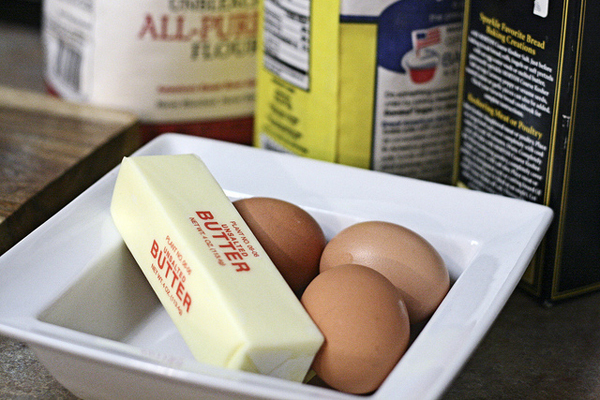 First, use room temperature eggs and butter for easier beating and mixing. It requires some forethought, but it’s worthwhile. Second, use cake flour if the recipe calls for it. And sift it if the recipe suggests it. I prefer to use a mesh strainer to avoid the hand crampage usually associated with the more traditional sifter. Now let’s get on with these cupcakes. 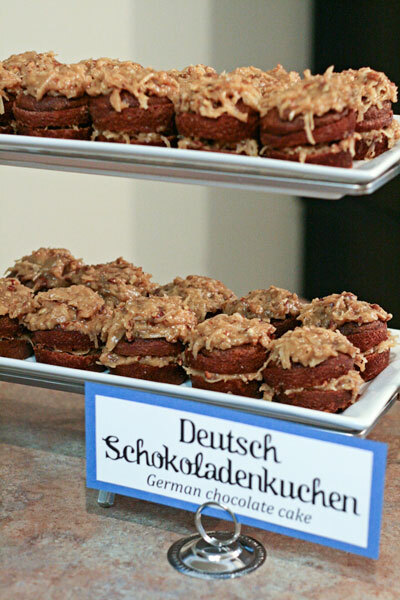 Despite its name, German chocolate cake did not actually originate in Germany. But we love it and wanted to include it on our menu anyway. This cupcake recipe from Martha Stewart consists of melted semisweet chocolate chips and buttermilk, along with the usual suspects: butter, flour, baking soda, salt, sugar, eggs, and vanilla. Pretty simple. It’s the coconut pecan frosting that’s the real star. First, combine egg yolks, evaporated milk, brown sugar, and butter in a saucepan over medium heat until it thickens to a caramel consistency, which took about 15 minutes on my stovetop. 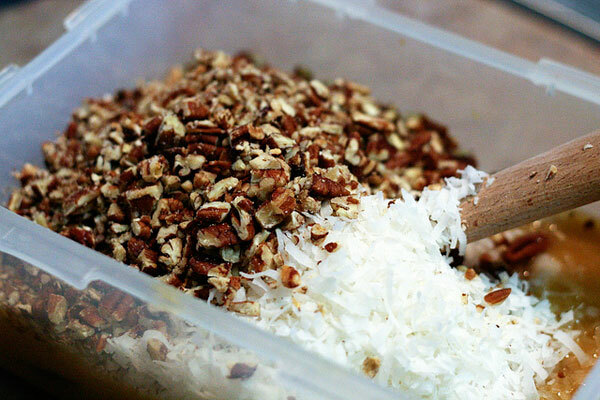 Then add the chopped pecans, coconut, vanilla, and salt, and let it cool (while trying your best not to eat it by the spoonful). I finished the above steps on Friday and stored both the cupcakes and the frosting in airtight containers until I was ready to assemble them on Saturday morning. Fortunately, my mother helped with that task since I had so many others to do. She did a great job, don’t you think? The cupcakes were a huge hit. I’m actually surprised the guests were able to keep their hands off the display until all of the main courses were served. They obviously have more self-control than either Nick or I do. Preheat oven to 350°. 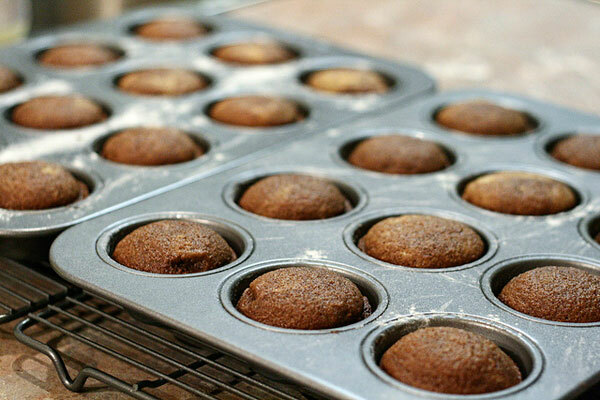 Brush standard-size muffin tins with butter, and dust with cake flour. In a medium-size bowl, whisk together cake flour, baking soda, and salt. With an electric mixer on medium-high speed, cream butter and sugar until pale and fluffy. Add eggs, one at a time, beating until each is incorporated. Beat in vanilla. Reduce speed to low. Add flour mixture in three batches, alternating with two additions of buttermilk, and beating until combined after each. Beat in chocolate until thoroughly combined. Divide batter evenly into prepared tin, filling each cup three-quarters full. Bake for about 20 minutes, rotating tins halfway through, until a toothpick inserted in centers comes out clean. Transfer tins to wire racks to cool 10 minutes. Run a small knife around the edges to loosen, and turn out cupcakes onto racks to let cool completely. Cupcakes can be stored up to 3 days at room temperature in airtight containers. To assemble the cupcakes, use a serrated knife to split cupcakes in half horizontally. Spread a heaping tablespoon of frosting on top of each bottom half and more frosting on top of each cupcake. 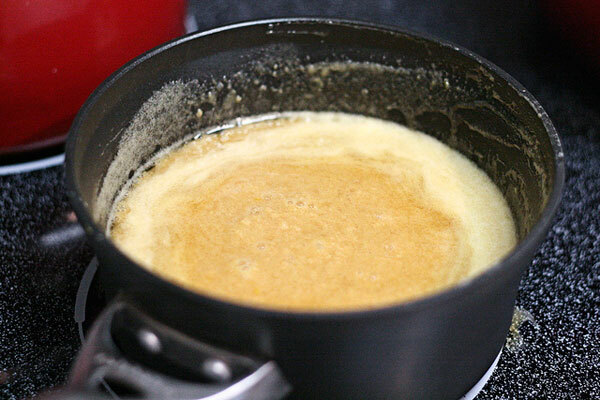 Combine egg yolks, evaporated milk, and brown sugar in a saucepan. Add butter, and cook over medium heat, stirring constantly, until thick like caramel, about 10 minutes. Pour through a fine sieve into a bowl. Stir in vanilla, salt, coconut, and pecans. Let cool completely. Frosting can be refrigerated in an airtight container for up to 1 day; bring to room temperature before using. Those look gorgeous! 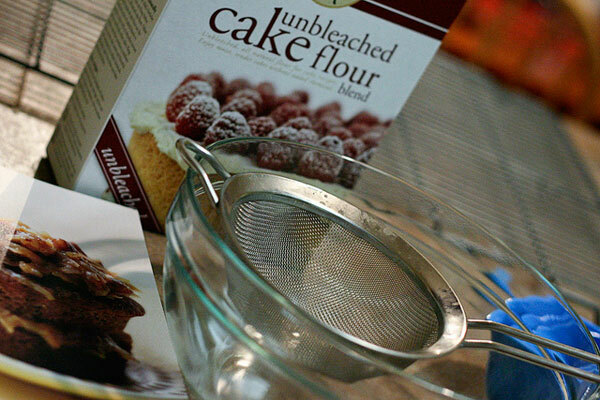 I always use a mesh strainer to sift my flour too! Its much faster than using a traditional sifter for sure. If I’m feeling extra lazy, I’ll just wisk the flour furiously. I’m not a fan of german chocolate cake (b/c I don’t like coconut) but Jon definitely is — that’s what his groom’s cake was! I may have to make these for him sometime. As for you taking a day off to cook and clean and party prep, well, I’ve done that twice this fall, and for much smaller gatherings… it’s sort of a nice treat to yourself, isn’t it? Very nice post. Love the photos. YUM! I’d love to make these. I’d love to have a platter in front of me right this moment, actually. Totally agree on the mesh sifter, by the way – I don’t even own the regular kind! These look delightfully decadent!! Your party looks like it was a success and I love your party decorations and food displays! 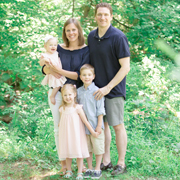 I found your site via Anna’s post about your party and you did an amazing job! I love going to Oktoberfest and your party looks just as good as the real thing. 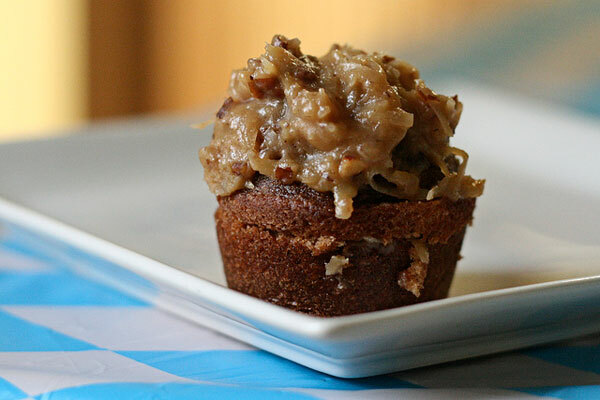 I was so glad you posted in her comments because I was going to comment and ask her if you’d be willing to share the German chocolate cupcake recipe, and voila you already have! So excited to try these, they look delectable. Thanks for stopping by! You will love these cupcakes! Good! In all of the country that I know who is baking a cupcake, German amazed me in what the outlook of their cupcake. It seems like native. I’ll like to try this German cupcakes of yours. Thanks for sharing.